Residence Rooms i Sarajevo, Bosnia og Herzegovina: Bestill nå! 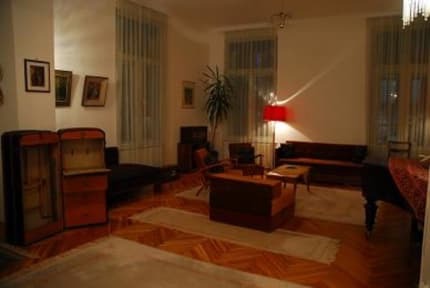 The Residence is ideally located in the most historical and central area of Sarajevo, (Bascarsija), within a walking distance to all major attractions, and interesting spots of Sarajevo, with a super transport network at your door. In a 105 year old building, we invite our fellow travellers to relax in our music lounge, enjoy a film in the TV/DVD room, or read our books and surf our fast internet. We appreciate the importance of clean facilities, therefore we'll be cleaning all day long, making sure everything is spotless. Our facilities include 9 bathrooms with 9 hot showers 24 hours a day. Dinning room with TV/DVD, Music lounge, reading lounge, piano and free use kitchen. RESIDENCE is designed in order to provide you the best stay in one of the most beautiful cities of Balkan. Enjoy a friendly, fun and intimate atmosphere for young travellers, hopefully making you feel at Home. 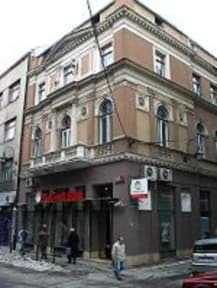 The RESIDENCE is ideally located in the most historical and central area of Sarajevo, (Bascarsija), within a walking distance to all major attractions, and interesting spots of Sarajevo.